No matter what you do, never go back to what broke you. A bend in the road is not the end of the road... unless you fail to make the turn. Every person faces difficulties throughout their life. Despite our circumstances, and with God's help, we can choose to be better instead of being bitter. Sometimes we wonder whether the path we've chosen is right. We look back and alienate ourselves from that particular path, and place each other in a different place. But that's not how life works. Sometimes learning the move on, is the only option. Choice is everywhere. We are given the choice between happiness and sorrow, good and bad, right and wrong and so on and our right choice determines our destiny. Zig ziglar says, “Every choice you make has an end result”. If we choose a job that we enjoy, we would never experience boredom. Given that external circumstances that are out of our choice, like the natural elements, we can but choose how to respond to them. Our habits and actions are influential in deciding our lives and therefore it is imperative to choose the right habits. Happiness comes from a conscious choice to live life joyfully. Kahlil Gibran said “we choose our joys and sorrows long before we experience them”. Happiness is a choice that requires effort at times. 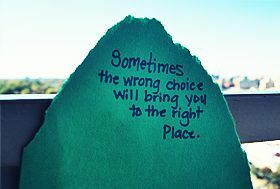 So, choice is clearly in our hands to be or not to be and wise men are those who make the right choice.